Well kept 1227 sq/ft bungalow nestled in the pines on gorgeous 2.41 acre parcel. 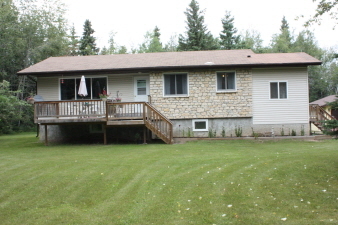 Situated close to Christopher Lake & Emma Lakes. Main floor features large eat in kitchen with island & oak cabinets, living room, 3 bedrooms & 4 piece bath. Basement partially finished with large rec. room (concrete floor) bedroom & 2 piece bath (r/i for shower) and cold room. 24 x 22 detached garage. 2 storage sheds. Water from well, apple trees, well manicured yard. 2 decks. Septic to mound. Water Softener Included. 2017 all bi folds & doors freshly painted. Energy $72. Power $71.